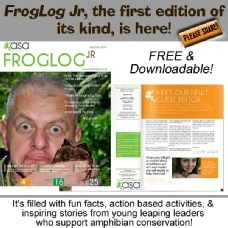 Avalon worked with the Amphibian Survival Alliance as their Guest Editor to create the first youth edition of their publication! 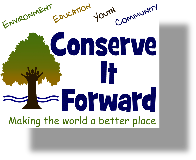 Please share this great, free, downloadable resource with everyone you know, including classes, camps and other groups! One of our favorite parts of doing programs in the community is talking about frog adaptations! 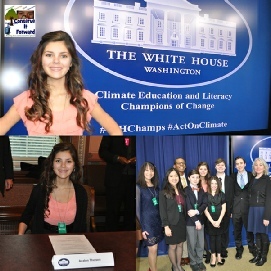 White House to talk about climate change! Paris: COP21/United Nations Climate Change Conference: Connecting with students from around the world! 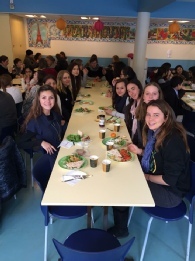 Sharing lunch with fellow student leaders and activists from around the world - included in this photo are students from Green School Bali, Roosevelt School of Peru, Marymount International School, and the American School in Paris. Our new course about changemaking successfully launched in fall 2017 with an 8 week session. Look for registration information for Fall 2019 coming soon! for our entire planet and all living things in it!" Eat Aware Today bookmarks are ready to ship to you! Join us in hiding painted rocks and bringing smiles to others! Similar to our Care Cards which brought nature and happiness to thousands of people in all 50 States and Canada, our volunteer decorated rocks bring smiles to people everywhere. Join us by decorating & hiding your own rocks! 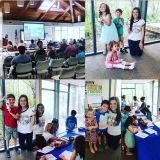 Thanks for joining us in March at Brooker Creek Preserve to learn about frogs! we had a great time with all the attendees! We learned about frogs, croaked in the Human Frog Chorus, and got some great artwork for our 2019 Save the Frogs Day social media campaign!